When heading out for a night on the town, you may find the toughest decision can be whether to go with the box of donuts or the stack of pancakes. This may sound like menu choices, but we’re talking outfit accessories—and it’s always best to go with your gut; your food gut. 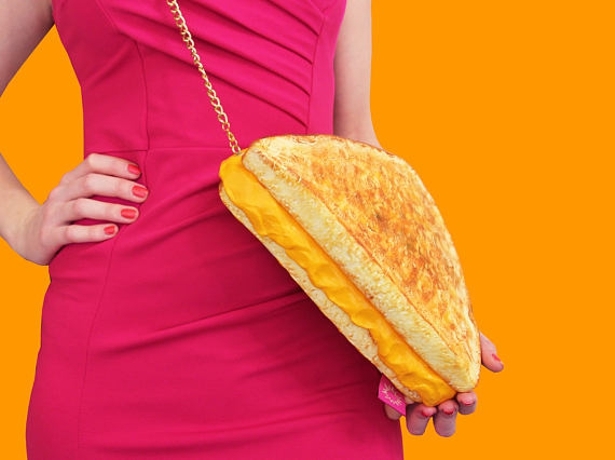 Rommydebommy’s etsy store is filled with delicious looking cakes and cookies, even savory tacos, and more—all of which are actually handbags that look incredibly realistic. Rommy started making these realistic food accessories two years ago when she couldn’t find fun handbags in stores. She spends hours on the internet looking at food (like we all do) but she turns her browsing into research and gets inspiration for her creations. I spoke to Rommy about her creative process, and she told me her goal is to always make the food incredibly realistic. “If I’m making a slice of cake, I make sure I use really soft sponge foam to get that cake effect,” she says. She takes into account how the food actually looks, then intricately replicates the shapes, colors and textures. The process takes days to weeks, due to all the details she creates by hand. She makes more than just tasty totes: her men’s line of food bowties are hysterical. A perfect bowtie-pasta-bowtie just makes sense. Even her faux sour candy tie looks deliciously dapper. Women can also decorate their neckline with snack necklaces that resemble a handful of buttered popcorn or eye-catching sour gummy worms. Check out more of Rommy’s food accessories in the gallery online at Rommydebommy on etsy. Would you carry a cake clutch for a night out? Let us know in the comments!